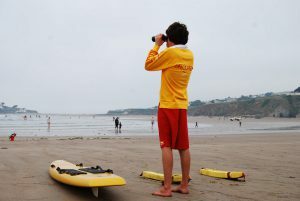 To support public safety, our Clubs have been undertaking voluntary patrolling on their beaches with trained Lifeguards since 1952. Starting in1990, some also operate Inshore Rescue Boats. In 2017, working with the Coast Guard, we replaced informal patrol activity with a revised, fully supported and managed programme to meet higher uniform standards. Our Patrol Framework is now the operational structure for our declared patrol activity. This scheme was successfully piloted in 2017 at 8 coastal and 2 inshore locations. During 2017, 66 responses were undertaken by our declared coastal patrols and 84 by our 2 Inland Lifeboats. During 2018 we are increasing our declared volunteer coastal patrol teams at a further 12 locations and in subsequent years further increases will be made. We are approaching this in careful steps as it requires training further Patrol Captains to manage patrol activity and formal on site audits of equipment, competencies, LOP’s , EAP,s and first aid facilities. Each Patrol is only activated and declared when these formalities have been fully completed and an annual agreement is entered into confirming capability. In-season audits are undertaken and all incidents reported. We are building a modern and highly effective open water volunteer search and rescue service fully compliant with the National SAR Framework.